Starting March 1st, each week we’ll reveal a new musician or band featured in The Rolling Stones Years book. For one week only, purchase any size print from the book of the featured musician or band, and choose your two giveaways. The Hitch…? (Isn’t there always a hitch?) You will have only one week to purchase a print of the featured musician AND get the extra giveaways! Once that week is over, a new featured musician or band will revealed and the giveaway offer then applies only to the new musician/band. Fair warning: these giveaways are available only for the next ten weeks! What’s more…? We’re offering FREE SHIPPING to destinations within the continental United States! 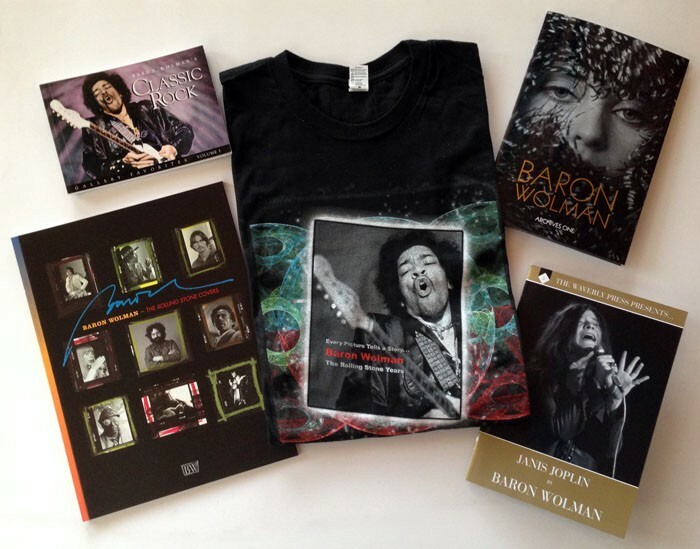 This is truly a great offer as virtually none of these giveaways is available in stores (and you get to select TWO), and they come signed by Baron himself! Stay tuned…next week we’ll reveal the first musician or band featured in this offer! In the words of the great Janis Joplin…Get it While You Can! Previous post: And Now for Something Entirely New!